I work on C2 West the Oncology haematology ward at the Sydney Children's hospital looking after children with Leukaemia, blood disorders and other childhood cancers. I see so many young children and their families lives effected dramatically by the diagnosis of cancer. Survival rate in Australia is promising, however more children die of cancer than any other disease in Australia and it isn't uncommon for me to see many relapses and sadly babies children and adolescents pass away. I want to make a contribution to research, better care and improved outcomes in a challenging (and hopefully fun) way. I'm in no way athletic and its guaranteed I will finish last very sore but please support me and help me raise much needed funds so we can make the health outcomes and survival rate of childhood cancers even better! 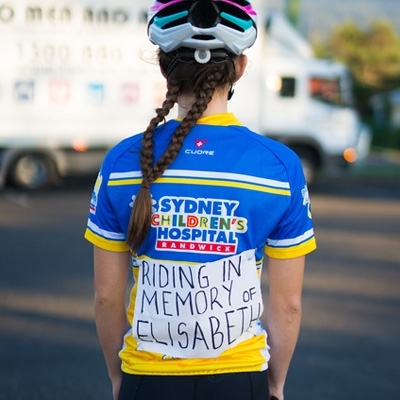 On the 6th of May my father (who is a cycling obsessed MAMIL) and I will be riding 83km along the central coast finishing at the Sydney Children's Hospital Randwick! Wish me luck!